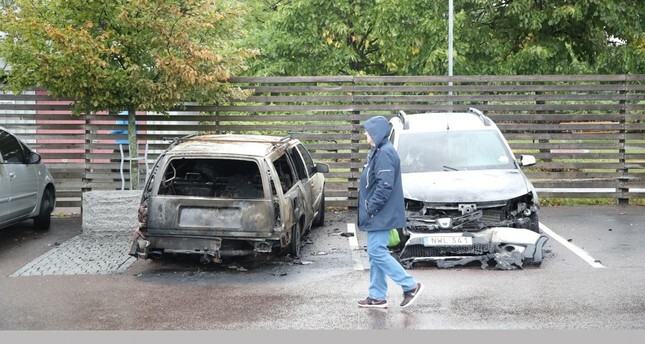 Dozens of cars were set on fire at Frolunda Square, Gothenburg, Aug. 13. Groups of youths set fire to cars as they went on the rampage in the Swedish city of Gothenburg and a few surrounding towns on Monday night, in attacks Prime Minister Stefan Lofven said looked organized. Sweden has seen a rise in violence in areas with high unemployment and other social problems and Monday's disturbances echoed rioting in the capital Stockholm in 2013, although it was unclear what triggered the latest rampage. Mounting public concern about gang-related and other violence has become a central issue in campaigning ahead of a national election next month. Police said that up to 100 cars were either set fire to or vandalized in Gothenburg, Sweden's second-biggest city, and in nearby towns such as Trollhattan, an industrial area with high unemployment, and Falkenberg. Police did not say what might have spurred the violence, confirming only that gangs of youths were involved but did not say how many people. "We believe that up to 100 cars have been burned or damaged," police spokeswoman Ulla Brehm said, as reported by Reuters. "They were organized and prepared." A handful of cars were also burned overnight in Stockholm. Swedish Prime Minister Stefan Lofven lashed out at the perpetrators, asking them: "What the heck are you doing?" In an interview on Swedish radio, he said he was "really getting mad" and that "society must react in a tough manner," The Associated Press reported. He said the fires seemed to be "extremely organized." No injuries have been reported. However, the fires occupy police and rescue officials and frighten residents. "You damage residential areas and ruin it for your neighbors," Lofven said. "I am speechless. This so terrible, it's destructive and it's pure evil," Jonas Ransgaard, a member of the Goteborg City council, told local daily Goteborgs-Posten. The violence echoed rioting by hundreds of youths in Stockholm and some of its poorer suburbs in 2013, sparked by the police killing of a 69-year-old man wielding a machete in a suburb of the capital, which prompted accusations of police brutality. Law and order is a key issue ahead of the general election on Sept. 9 after a spike in gang violence in Sweden saw more than 40 people shot dead last year. As well as rising violence, voters are worried about a creaking welfare system, falling school results and the effects of a surge in immigration that saw around 160,000 people seek asylum in Sweden in 2015. The concerns have benefited the populist, anti-immigration Sweden Democrats who could become the second-biggest party in parliament after September's vote.